Akron/Family has the distinction of being the band that first took Warpaint on tour and as many of you who were lucky enough to catch that rather excellent show at the Granada last year know, A/F doesn’t just take any band on tour, they take bands who can help them turn the venue into a swirling tempest of dancing chaos. This bodes well for Thursday night’s opener (and 35C) performer Delicate Steve. The most recent A/F offering, Akron/Family II: The Cosmic Birth and Journey of Shinju TNT, continues the bands deconstruction of what “folk/experimentation” should be as they yet again push the boundaries on what you would expect from their earlier work. We consider this a good thing as it’s actually kind of fun to watch a band continually evolve. This Thursday you will have a chance to see if anything I just typed is true as the band takes over the cozy confines of The Loft, and because we love you we’re giving away two pairs of tickets for the show. To win, send an email with “Akron/Family loves you” in the subject line and your name in the body (seriously … we only want your name) to giveaways@daybowbow.net by 11:59 p.m. We’ll notify winners tomorrow/Wednesday. Akron/Family plays The Loft on Thursday, March 31 with the very danceable openers Delicate Steve. The show starts at 8:30 and tickets are $12 in advance and $14 the day of the show. Destroyer began in 1995 as a solo project for Dan Bejar, the Vancouver singer-songwriter also known as a member of The New Pornographers. Since then, the project has expanded to include other various members and has released 13 studio recordings, nine of them full-length. The most recent Destroyer offering, is a quirky (a style Bejar is a master of) take on 80s pop-rock. It’s a continuation of Bejar’s experimentation with different sounds and genres. No matter what the genre, however, the music is always distinct because of Bejar’s voice. On Saturday, Destroyer will be bringing its special brand of music to The Loft. And we have two pairs of tickets for the show. To win, send an email with “Destroyer” in the subject line and your name in the body (seriously … we only want your name) to giveaways@daybowbow.net by 11:59 p.m. We’ll notify winners tomorrow. Destroyer plays The Loft on Saturday, March 26 with openers War on Drugs and Nervous Curtains. The show starts at 8:30 and tickets are $12 in advance and $14 the day of the show. Regular readers are aware of our love for Elephant 6. So you can imagine how our fan-boy/fan-girl excitement has been building in anticipation for the return of their Holiday Surprise Tour (which Elf Power’s Andrew Reiger told us about last October, when it was in the planning stages). 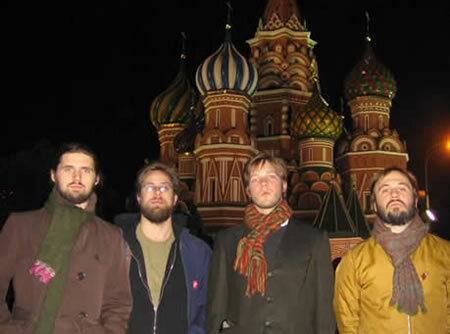 The first Holiday Surprise Tour was in 2008. Elated fans gathered to see members of Olivia Tremor Control, The Gerbils, Elf Power, OTC, The Music Tapes, Circulatory System, The 63 Crayons and Neutral Milk Hotel (including Jeff Mangum himself) play songs from a variety of E6 bands. This year the tour includes Will Cullen Hart , Bill Doss, Peter Erchick , John Fernandes , Julian Koster , Scott Spillane , Andrew Rieger, Laura Carter, Derek Almstead, Heather McIntosh , Bryan Poole , Theo Hilton, Robbie Cucchiaro and others playing the music of The Olivia Tremor Control, Elf Power, Circulatory System, Neutral Milk Hotel, The Gerbils, Nana Grizol, Major Organ and Adding Machine, Pipes You See, Pipes You Don’t. There will also be “games, films & other surprises”. Rumor has it that Jeff Mangum will be one of those surprises. We are thrilled to be going to the Holiday Surprise Show on Tuesday and we are also thrilled to be giving two readers a chance to bring a guest along. If you want a pair of tickets, send an email with “Elephant 6” as the subject and your name in the body to giveaways@daybowbow.net by 11:59 p.m. We’ll notify winners tomorrow. The Elephant 6 Holiday Surprise Show is at The Loft on Tuesday, March 1. Tickets are $12 in advance and $14 on the day of the show and doors are at 7:30 p.m.
Sebadoh’s existence has spanned 25 years and in that time the band has had its share of lineup and record label changes (with nine releases on six labels). What started as an outlet for Lou Barlow’s songwriting outside of Dinosaur Jr. (as he felt intimidated and overshadowed by J. Mascis) became an indie rock powerhouse unto itself. 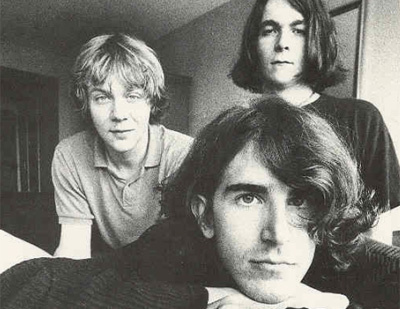 When Barlow was kicked out of Dinosaur Jr., Sebadoh became his main focus. It was also a means for him to take control of a musical project and express the pent-up anger and tension caused by his tenure in and ejection from the other band (which he has since re-joined, of course). The group also stood as an integral part of the formation of the lo-fi scene, along with bands like Pavement and Guided By Voices. Barlow continues to use Sebadoh as one of the many showcases for his musical talent. And the band is currently on tour in support of the reissues of Bakesale and Harmacy, their most commercially successful albums. The tour will hit The Granada this Friday and we have a pair of tickets. For your chance to win them, send an email with “Sebadoh” in the subject line and your name in the body to giveaways@daybowbow.net by 11:59 p.m. We’ll notify winners tomorrow. Sebadoh will play The Granada on Friday, February 18 with openers Quasi and DoveHunter. Tickets are $20-$36 in advance and $22-$39 the day of the show. Doors are at 8. When they ended their 15-year run (with a long list of lineup changes) in 1997, influential New York post-punkers Swans left behind a broken-hearted fan base. But last year, founder Michael Gira resurrected the group and they released My Father Will Guide Me Up a Rope to the Sky in September. And their sound is just as loud and intense as it was in their early years (or, as Gira calls it, simultaneously “soul-uplifting and body-crushing”). Dallas fans will have a chance to catch the group live when they play South Side Music Hall this Saturday. And one of our readers (and a guest) will get to see them for free. If you want a shot, send an email with “Swans” as the subject and your name in the body to giveaways@daybowbow.net by 11:59 p.m.
Swans will play South Side Music Hall on Saturday, February 19 with openers Wooden Hand. Tickets are $20 in advance and $25 the day of the show. Tapes ‘n Tapes might be the prime example of a “blog band”. Their debut album, The Loon, gained its initial attention and success from blurbs on sites such as EAR FARM and Gorilla vs. Bear before being lauded by the grandaddy of all music blogs, Pitchfork. That first bit of attention came in 2006 and the band is still going strong. They released Walk It Off (produced by Dave Friddman) in 2008 and they are currently touring in support of Outside, released last month. Tapes ‘n Tapes will be making a stop at The Loft this Saturday and we have two pairs of tickets. For your chance to win a pair, send an email with “Tapes ‘n Tapes” as the subject and your full name in the body to giveaways@daybowbow.net by 11:59 p.m. Tapes ‘n Tapes plays The Loft on Saturday, February 19 with openers Oberhofer and Les Americans. Tickets are $15 in advance and $17 the day of the show. I don’t think Robyn needs much of an introduction, but she still deserves one. The Swedish pop star started her career 15 years ago and has found worldwide success ever since. She had two hits in the US, “Show Me Love” and “Do You Know (What It Takes)”, in 1997 but her subsequent releases barely made a splash in the states. That is until last year, when she began releasing singles from the album Body Talk . (which she has released in three parts) “Dancing on My Own”, which received two Grammy nominations, is probably the most popular (though “Hang with Me” has garnered its share of covers, including one my Denton’s own Sarah Jaffe). Now Robyn is adored across several demographics, although her altered, electro-pop sound makes her more of an underground darling than a pop princess (well … queen … she’s past that princess phase of her life). Hell, Jaime even loves her … like, really loves her. And we have two pairs of tickets to see Robyn at South Side Music Hall this Friday. Just send an email to giveaways@daybowbow.net with “Robyn” in the subject line and your name in the body by 11:59 p.m. We’ll notify winners tomorrow. Robyn plays South Side Music Hall on Friday, February 18, with openers Diamond Rings and Natalia Kills. Tickets are $22.50 in advance and $25 the day of the show.